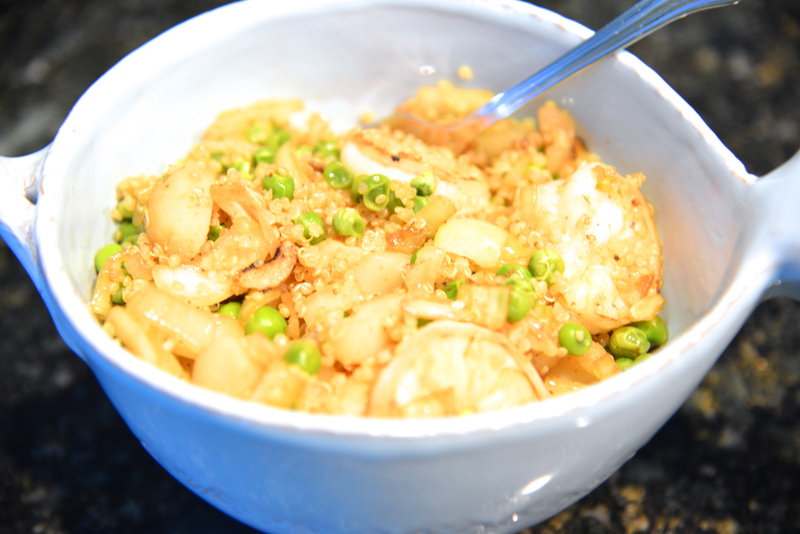 Ingredients: 1 egg (optional), 1/2 a cup of quinoa, 1/2 a cup of peas, 1 small onion (chopped), 6 water chestnuts (chopped) or 8-10 sliced, 1/2-1 tablespoon of roasted garlic slices, 1/2 a tablespoon of toasted sesame oil, 1/2 a tablespoon of low sodium soy sauce, 6 shrimp, salt and pepper (to taste). In a non stick sprayed pan (or wok), over medium heat brown your onions with garlic flakes. If you want to add an egg, do so at this time. Prep as you would a scrambled egg. Once your onions are translucent throw in your shrimp. While mixing, stir in peas and quinoa with sesame oil and soy sauce. Continue tossing ingredients until the shrimp are cooked through. Remove from heat and toss in a sprinkle of salt and pepper.